How Does Playing Sports Make You More Healthy? There's no doubt that playing sports can potentially benefit your health. Some of the benefits are more obvious, but you may be surprised to find out that you can benefit not just physically, but emotionally as well. Before starting any new sport or exercise regimen, though, consult your doctor to make sure it's safe for you. Most sports involve a certain level of physical activity; some more, some less, but all typically get your heart pumping faster at least part of the time. The U.S. Department of Health and Human Services recommends all adults get at least 150 minutes of moderate-intensity exercise each week, or 75 minutes of vigorous intensity each week, to help stave off chronic diseases such as diabetes, arthritis and heart disease. Of course, it's still important to check with your doctor before embarking on any new sport. The most obvious benefit to playing sports is the benefit to your physical body, but sports can help your mind stay healthier too. In fact, researchers at the University of Edinburgh found that older people who participate in sports and exercise had significantly less brain shrinkage overall -- a sign of dementia and Alzheimer's disease -- than those who didn't do as much exercise. Most sports involve working cohesively in a team environment. Even sports with individual scores, such as swimming, have a team-building component, such as when that swim team goes to a swim meet in another city. With that team component can come more cooperation skills, more focus and more commitment, reminds the Yale Medical Group. All of that can lead to healthier relationships with other people and a healthier outlook on life. Numerous studies have shown that participating in sports also correlates to more success in school and work. A report from the Centre for Economic Policy Research, as reported in the Wall Street Journal, found that people who participated in sports earned higher pay. Students who participate in sports also tend to have higher grade point averages, better attendance and a higher likelihood of going to college, suggests Dr. David Geier, a sports injury physician based in South Carolina. More success in these areas can lead to a number of better outcomes, including better access to health care and more resources to deal with health-related issues when they arise. 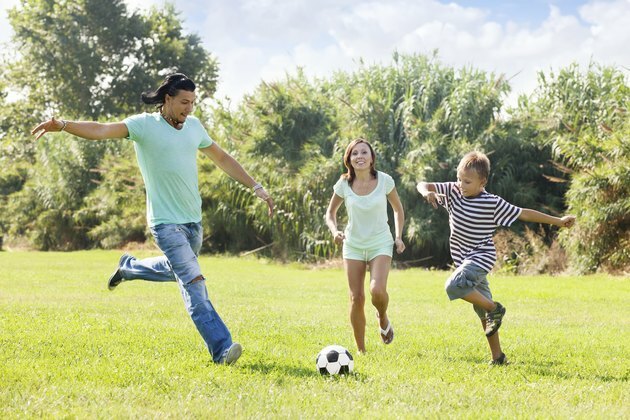 Dr. David Geier: The Benefits of Playing Sports Aren't Just Physical! What Are the Benefits of a Two-Parent Household? What Is the Importance of Sports in Our Lives? Does Participation in Sports Negatively Affect Academics? How Does Playing Sports Affect Someone's Life?